In an effort to keep our greens in the best shape possible health wise during the summer, we vent our greens every few weeks. Mr Webster describes to vent is to provide an outlet for air, gas and liquid Exactly the three things we are trying to accomplish when we vent our greens. The first venting occurred around June 1st with a needle tining using our large tractor and verti-drain machine. The next two applications including today's are made by E&E Enterprises, a contracted service who provide three hydroject machines to our site. A row of 3000 psi streams of water are shot into our greens creating a near pencil sized hole that goes about 4-5" deep into the sand profile. The greens were top dressed with sand before the venting, we then rolled them and brushed them after the hydrojecting was completed. Below is an explanation of how air, gas and liquid are effected by this venting action taking place in our green profile. The vent hole allows oxygen to enter the green sand profile improving the health of our roots and encouraging microbial activity. CO2 gas/carbon dioxide can build up in the soil and the venting holes allow this trapped gas to exit. The holes allow excess water to move through the profile quicker and at the same time if we were dry would allow moisture to enter the complete profile much easier. The vents also will help dry out our saturated sand profiles. The vents also help in reducing the temperature of our sand profiles, especially when they are holding water. Moisture is a great conductor of heat and will artificially warm up the soil much quicker when it is saturated than if the soils are at average moisture levels. As the soil profile increases in temperatures over 80-85 degrees, root hairs begin to die which are the structures where most water and nutrients enter into the plant. The less root hairs functioning, the more stress a plant will experience. 2.4" of rain since last night. Here are some of your morning highlights/lowlights. Looks like things are sinking to the south slightly. Maybe it will give us a break to get things straightened up. Still a substantial delay. Hours at this time. 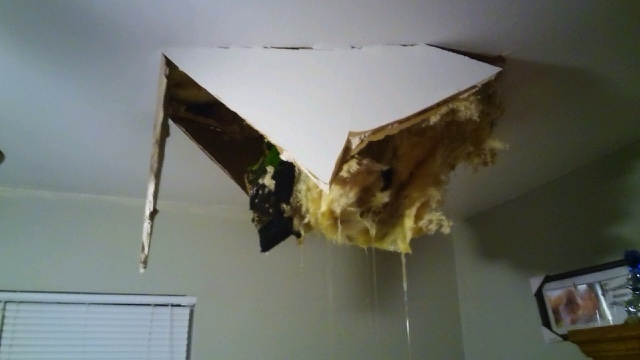 Top it off Assistant Skip had a tree fall next to house and part of tree went through the bedroom ceiling. Our work this morning has been delayed due to severe lightning. 1" of rain overnight with more on its way. More than likely we will have a substantial delay in today's start of play. No major tree damage but a few small limbs down in various parts of the course. Our goal today will be to get the greens cleared of water. Change the remaining 12 holes that I was not able to change last night and get things started as soon as possible. We will have some pushing of bunker sand but other than that, its all up to Mom Nature and when she decides to stop her influence over this event! Barrett and I have discussed our situation and will re-evaluate in a few hours once we see how much rain we receive. Check your email, he is in the process of sending out a communication to all involved. Excellent discussion from Bradley Klein regarding the greens at Chambers Bay. 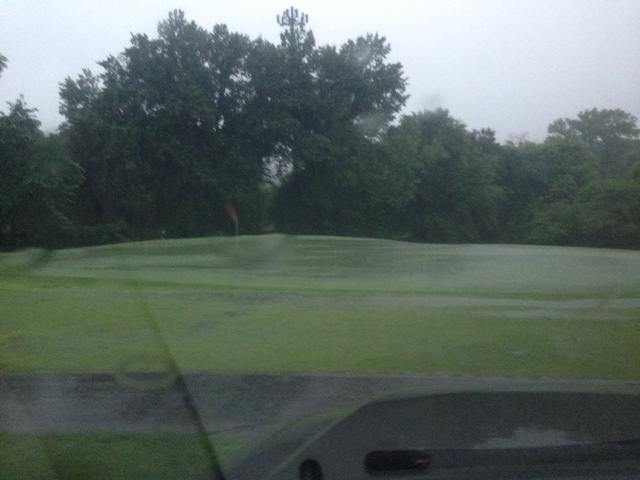 Our greens at Glen Echo no doubt are green, we are not hosting a major championship. I can't imagine with our segregated greens and different textures how they would look on 55"HD TV even if they were green in color! I was blessed to have a great dad. He taught me how to live a good life by example. Hard work, determination, dedication and to be selfless. He demanded that we do the right thing when it came to dealing with people. Giving to others was a part of our families fabric. My life as a youngster was a dream. Dad took me everywhere. Scouting trips for ball games, attending ball games as fans, fishing, camping, all the great things kids loved to do. He could do about anything except keep a clean inside of his vehicle, his office and work on 2 cycle pieces of equipment. If my dad was still alive today, he would be having conversations with me about trees I wanted to remove on the golf course. The gnarliest tree he would say had character. 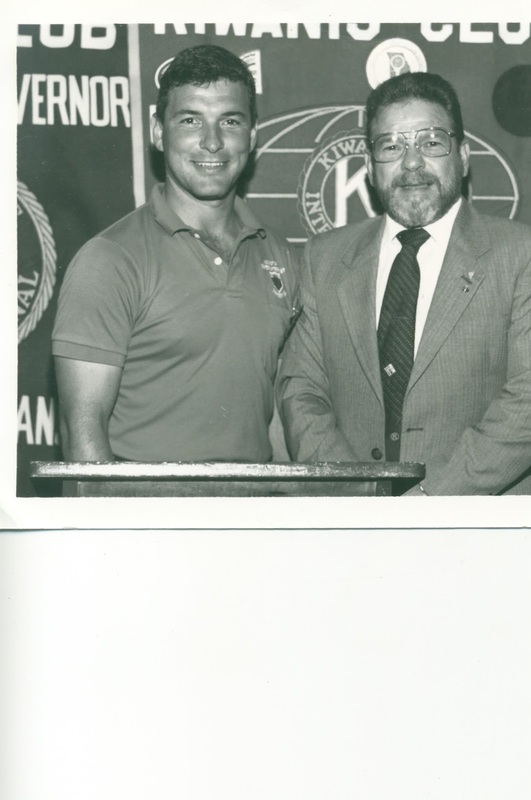 I know he would have great appreciate for this property, he was actually here at Glen Echo with me and my brother when the idea was hatched for me to get into this great business. I hope you have a great day today and enjoy yourself. I always love seeing our dad's out with their sons/daughters at the club. You are making memories for your child that will last them a lifetime! I've been watching like most of you with interest regarding Chambers Bay and The US Open. Do I have an explanation what is going on there, sorry to say I don't have a clue. I do know that most tournaments no matter if it's the local 9 hole muni yearly championship, The Invitational at Glen Echo or a US Open, the #1 goal of a Super is firm and fast. The men who manage this course work in cooperation with Mr. Davis from USGA and have committed the last 5 years of their lives for this tournament. They have forgotten more than I will ever know about fine fescue and the facility they manage so I trust in their plan. Arm chairing from 1500 miles away is something that I can't even attempt to do because of my lack of knowledge about fine fescue. When turf is placed on the edge like it has been the last couple of weeks, it takes just a slight drop or increase in humidity, wind and temperature to create extreme conditions. I fully understand what weather does to a facility. 2 years ago we had a white out rain on Tuesday afternoon. Nearly 2" in less than an hour. The Thursday of practice round I was questioned about green speeds, are they going to be faster. By Saturday of the event, hot spots were coming out on the greens because of the heat and drying conditions and some were calling for Uncle to show up. We can attempt to manufacture speed at the risk of damaging turf for the rest of the season but my green committee and myself have agreed that this type of behavior for one single event at the club is not the right thing to do. A major loss of turf on a green is catastrophic for a club. Speed of our greens is kind of non-existent right now. We have skipped mowing greens this week 2 out of the last 4 days because of excessive wet conditions. Excessive moisture and temperature increases microbial activity in which more nutrients are released increSing growth. The greens have not been rolled since last Saturday which is a major contributor to our ball roll out program. Rolling each day has s tendency to keep ball roll out elevated. We reduce mowing during soft conditions to prevent scalping. Scalped greens can lead to Basal Rot Anthracnose and other stress related diseases that are not easy to manage during the potential for high temperatures of the summer. I'm 5 days away from my National Championship and my course is not where it needs to be right now because of the rain. My greens are slow and soft, growing like crazy, and are close to being damaged if I attempt to get speed out of them in there current condition. We are in need of a regulator application which I will apply tomorrow, Sunday. This will slow growth and improve ball roll out. It will also delay growth during PM rounds of Invitational. The speed we will receive will occur from rolling. We have not rolled since last Saturday. We can usually gain 2' of ball roll out before a tourney. Drying conditions and lower humidity can increase roll. The fairways are nearly as long as the intermediate and the intermediate is almost as long as the rough but everything is green and growing. My experiences tell me to stay calm and be patient. If the weather cooperates, we will be able to provide the best conditions possible for our members and guests. Sloppy conditions and 5 days from The Invitational calls for the better side of our members and the need for proper etiquette regarding repairing pitch marks, divots etc. Very important to repair ball marks, step down your divots and place some sand on tee ground areas. 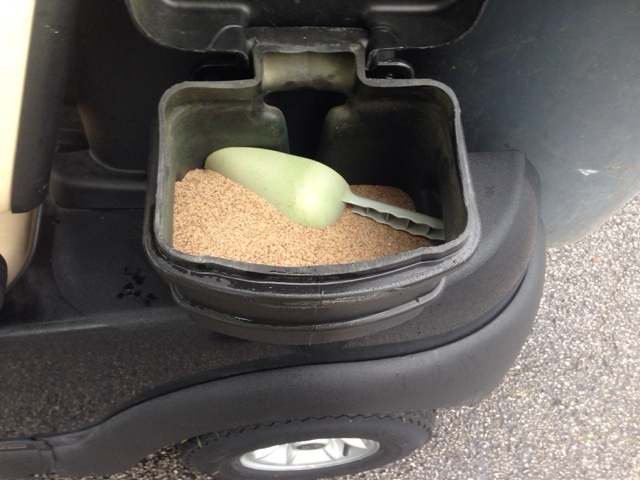 Maybe take that scoop from your cart out to the middle of your fairway for a quick throw down of sand. 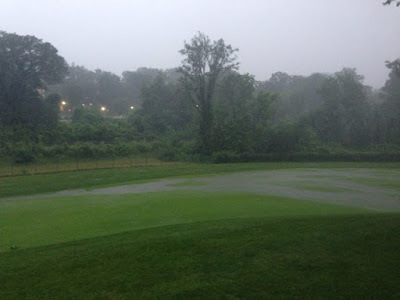 We will try to get out and move tee markers mid day to reduce damage to our teeing grounds and will follow up in morning with sanding of tees and pitch mark repairs that were missed. Your assistance to the players behind you I am sure will be appreciated as our playing surfaces appreciate your effort as well. We will open the course on Saturday for play. It will hopefully drain enough to mow greens. We will rake the bunkers and need to change about 1/2 the holes which were not completed on Thursday. We will be raising our fairway height slightly for the first mow in 10 days and will then set them back again to our regular 5/8" cut for The Invitational. Whatcha been doing lately, I know there has not been a lot of golf ball chasing going on. At least the US Open is on to take up some of the time waiting for the rain to quit. 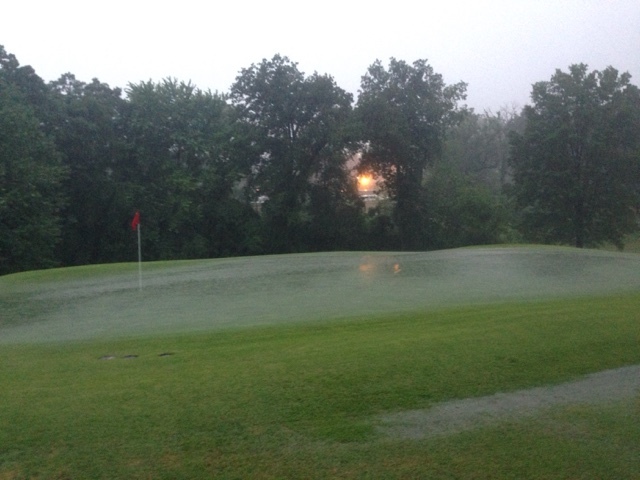 Well, luckily or not so lucky my men and woman have been out in the rain doing what they can on the golf course. Lightning has stayed away and the rain has been steady but not drowning except for today. We were able to mow some rough on Tuesday and were able to get 3 mowers out yesterday before the heavy rains came. A little tracking but we figured it would get washed away by tropical storm Bill. We had to skip mowing greens on Wednesday and Friday. Were able to mow greens Thursday and I'm hoping tomorrow morning. Five greens were sprayed yesterday, especially a couple of our worst with algae including the practice and #11. Most tees were cut and our tee and green surrounds got some sort of trimming in the last couple of days. We have not been able to mow fairways since a week ago Friday. Maybe Sunday or Monday if not dry by then. The staff has been going weed eater crazy trimming trees, structures, lakes, ornamental beds and etc. Becky has been still planting, mulching and pulling weeds while fighting off dive bombing mosquito's. Yesterday afternoon, the crew switched to cart cleaning mode beginning the process of giving a nice refreshing to our carts. With the tropical storm zeroing in on us, Fridays work involved a big time congo line of clean up work. A full 8 hour session from 9 staff members with Skip leading the charge. The work included the following. Spray the rubber floors with a product called Purple Power. Let it sit and then scrub with a brush. Power wash off. 70% of these were completed on Thursday. Use 3000 grit sanding pads to the body of cart and start scrubbing. Smooths out imperfections and cleans. Step 2 is a Meguiars Cleaner rubbed in. Step 3 is a Meguiars Polisher to shine them up. Then use a cleaner on the black plastic areas of the cart. Guys got all the floorboards cleaned, We have nearly 30 polished and plastic trim shined up. Will try to do more as we can. 1/2 and 1/2 cart. A little different from one side to the other side. Aged carts dress up pretty well. As you know, the velcro straps that hold the rain covers in place on days where we do not have rain have aged to the point of not working. We found some commercial grade snaps which we hope will solve the issue. Fairly easy to work and they do seem to hold fast in place. I've attached a video which demonstrates how the snaps should be used. The strap must be pulled from the front to the back or it will not come off. We will get all carts completed by early next week. Eight carts were changed today. Took a quick video of the Bee hive today. Gives you a little inside look into the hive. A little more detail as we go over the next few weeks. Was trying to get short range cut before 6 start when I saw lightning getting close. Went to check radar. Not good! Between 18 tee and 17 fairway large Pin Oak. Main road looking toward #8. 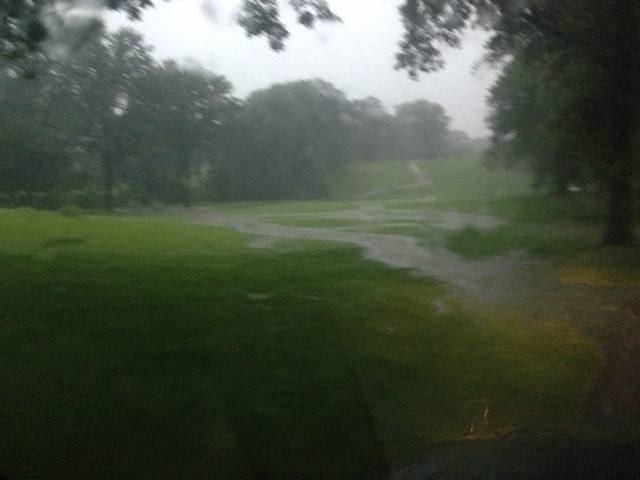 Rain put a damper on our tee aeration plans today. We will probably finish the work next week. Video discusses that work as well as the fairway turf situation, greens bunker edging and a couple of other areas. Photos below also add to discussion later of these subjects later in the video. Our Red-Tailed Hawks picked up stakes and moved to the Sycamore near 5 White/Blue tee this year. I had kind of lost track of them this season until Ms. Herrin mentioned where they were located. If my eyes don't deceive me I think we have 2 juveniles about ready to take off on their 1st flights soon! Bunker edging. Sand was deep enough along edge I had to use a spade shovel to reform the edge. Back 9 are complete as is Holes 8-9. Hope to finish the rest of the front next week. From time to time you will notice some black algae appearing on greens. This usually occurs because of climatic conditions, warm and humid conditions and sometimes and the end or past time for a fungicide application. The past 6 weeks have seen a weekly application of some type of required spraying product either it be a growth regulator, summer root disease management product and wetting agents to keep profile consistent in its moisture content. This is from the 2nd green and the ugly reddish colored turf is poa annua which does not like Paclobutrazol, a growth regulator product we have been spraying every 30 days or so to help reduce the impacts of poa on our greens. My last application last week was 1/2 the rate of the month before. As we get into summer, we cannot over stress the poa annua or it becomes poa deadua. Too much poa annua dying quickly could contribute to yours truly's untimely demise. This type of condition does help bentgrass grow into the area and improve our total amount of bentgrass coverage. Losing 20-50 poa annua is something I do not want to see in my lifetime unless I was spraying Round Up and trying to kill it.